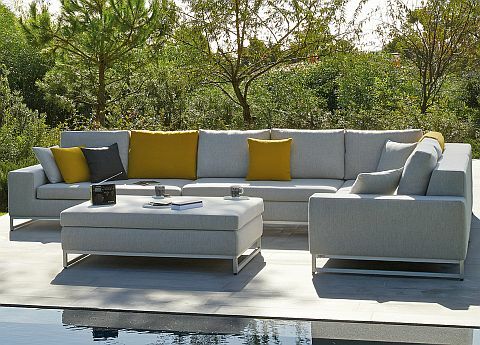 Some late summer outdoor furniture news from us (yes folks… summer’s not over yet!). We are delighted to be helping the talented crew over at Urban Roof Gardens, Europe’s leading roof terrace designers, with their forthcoming show garden at Design Junction 2018. Design Junction is a curated exhibition of the latest cutting-edge design. The event is part of the London Design Festival and takes place across three venues on the South Bank. We absolutely love the South Bank – it’s a fabulous part of our exciting city, with hundreds of international brands, boutique shops, tons of outdoor installations, as well as delicious pop-up eateries and bars – and it’s got one of the best views up and down the River Thames that you’ll find anywhere in this part of town. There’s also the Globe Theatre within spitting distance, along with Tate Modern and, just over the Millennium Bridge, St Paul’s Cathedral. It’s definitely a place where you feel history is slap bang up against modern, urban living. Urban Roof Gardens approached us a few weeks ago about using some of our outdoor furniture as part of their Design Junction project. The team felt it would fit perfectly with their contemporary designs, which will showcase a series of their modern roof terrace gardens. 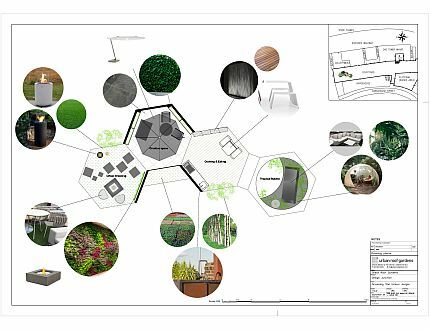 The URG roof gardens will be arranged across a series of hexagon shapes, with each space demonstrating different combinations of flooring, furniture and fittings, plus the company’s unique LiveProduct range – a ‘best-in-class’ collection of LiveWall, LiveRoof and LivePicture. We obviously don’t have any images yet (watch this space) but the plan above gives you an idea of what to expect. There will be spaces for ‘Urban Greening’, a ‘Creative’ space, a space for ‘Cooking and Eating’ and an intriguingly entitled ‘Tropical Bubble’. Hawaiian shirts not compulsory! The installation will be located in the Coin Street Builders Court Yard behind the South Bank’s famous OXO Tower. For those of you who don’t know it, this great building has been a riverside landmark since the 1930s, obviously owned in its prime by the makers of OXO, but its uses have been quite varied since then. It was majorly done up in the 1990s and is now home to a great mixture of flats, design studios, galleries, specialist shops, restaurants cafes and bars. Well worth a visit at any time of year just to mooch around the shops or simply soak up the fantastic atmosphere. 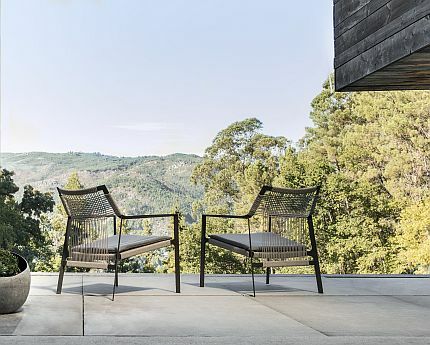 Go Modern’s outdoor furniture includes pieces from internationally renowned outdoor furniture designers Manutti and Tribu, two of our go-to specialists in some of the world’s best outdoor design. Many of their designs are made for super-yachts and top hotels as well as gardens and terraces around the world. The Nodi garden armchair, designed by the highly regarded Canadian creatives, George Yabu and Glenn Pushelberg, for leading Belgian outdoor specialists Tribu. The Nodi chairs are supremely light and comfortable with seats and backrests in hand-woven, stain-repellent, frost, UV and mould resistant CanaxÆ rope, which is stretched across a powder-coated stainless steel frame. The slim profile of the chair’s arm is angled slightly inward as the designers wanted to create a design with a ‘welcoming gesture’. From our other Belgian specialists Manutti, the elegant Napoli garden bar table will be put to good use. It’s sturdy enough for commercial and domestic use, and comes in two sizes with a wide range of finishes for both the top and the base, including a wonderful, hard-wearing, scratch-proof ceramic. And if a round rathre than square top is what you’re looking for it comes in that too. Look out too for the Tosca garden dining chairs, designed by the hugely talented Monica Armani for Tribu. The Tosca chairs feature super soft but firm over-sized braiding that wraps around the powder-coated stainless steel frame. It’s an eye-catching look and for those interested in the techy stuff, that clever shape is achieved by using a new foam mousse, contained in a seamless sheath of knitted textilene and polyolefine for greater weather resistance. The cushions can be covered in a variety of water and stain repellent fabrics, which now includes garden suitable velvet. 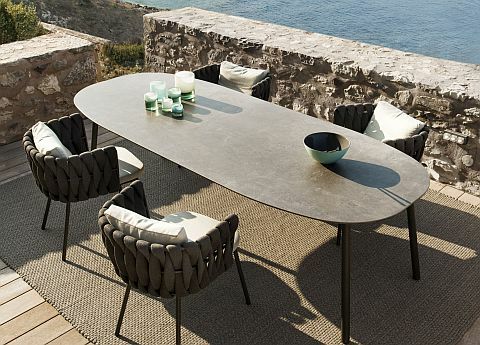 Tribu Tosca outdoor dining chairsAlso look out for Tribu’s Branch round bistro dining table, designed by Altherr Lievore Molina. The shape was inspired by the form of tree branches, beautifully fluid and organic, created to reflect our natural environment. 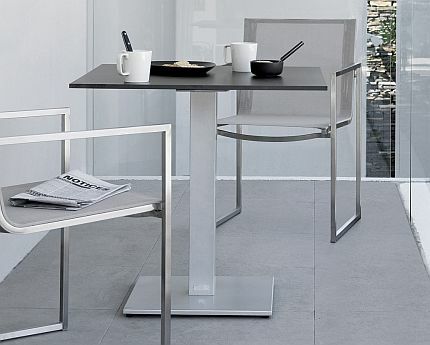 But behind the elegant and simple table is a complex combination of materials: The frame is made from die cast aluminium, powder-coated twice to create a scratch and UV resistant finish. Aluminium is a superb material for outdoor designs; easy to clean and weather resistant. The Branch design also comes in three colours: white, linen, or wenge. 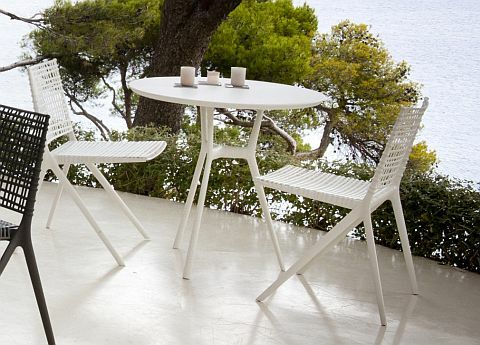 For the Branch table top you can choose from a variety of weather resistant garden suitable materials including Aluminium, A-grade Teak, or Granite, and there are three different sizes available. Also, and on it’s second ‘designer project’ outing of the year, is our Manutti Zendo modular corner sofa. This is one of Go modern’s most popular outdoor designs because it’s just so versatile, easy on the eye and incredibly hard-wearing. We have one on Go Modern’s small outdoor terrace at the Kings Road showroom and we find that once a customer sits down on it, they tend to stay for a while! So do pop along to the show. It’s on from the 20th to the 23rd September. Architects, designers and product specialists from Urban Roof Gardens will be on hand to answer any questions – and maybe this will be the start of your own urban ‘green space in the sky’ dream! Or just pop along… the show garden is in a public open space. One of the Go Modern team will also be on hand some of the time too and happy to answer any questions you might have about outdoor furniture (or you could try them on other topics… they’re a super friendly bunch!). Happy green dreaming! Previous PostPrevious If our customers are happy – so are we!